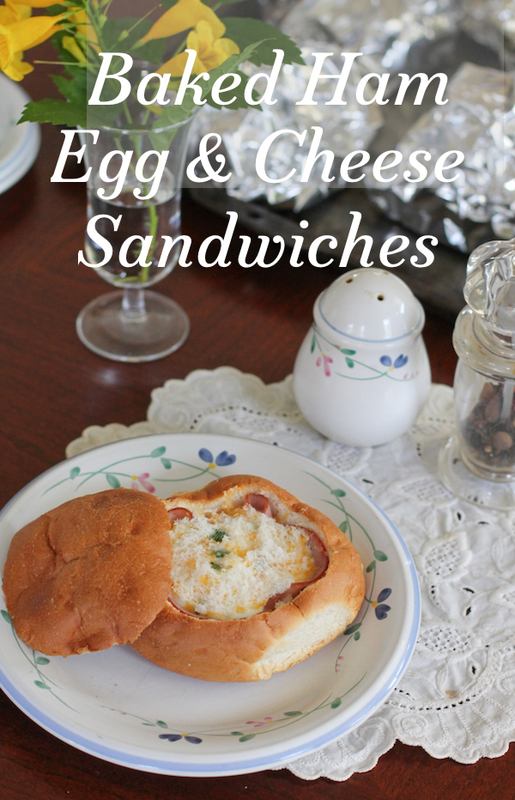 Baked Ham, Egg and Cheese Sandwiches are the perfect make ahead breakfast for three or a crowd of 20. Assemble the night before and bake them up hot and fresh when your guests wake up. I must confess that my go-to breakfasts for a crowd are usually pancakes, waffles or muffins. I make my life easy in the morning by getting organized the evening before, measuring out the dry ingredients into a big bowl and whisking together the wet ingredients in another bowl. I pop the wet ingredients in the refrigerator. All that’s left to do in the morning is to combine the two and cook the batter, a process so simple that even I can do it while simultaneously sipping on my first cup of coffee. To measure ingredients in the morning, I’d have to be on my second cup to ensure any degree of accuracy. I’m sure many of you can relate. 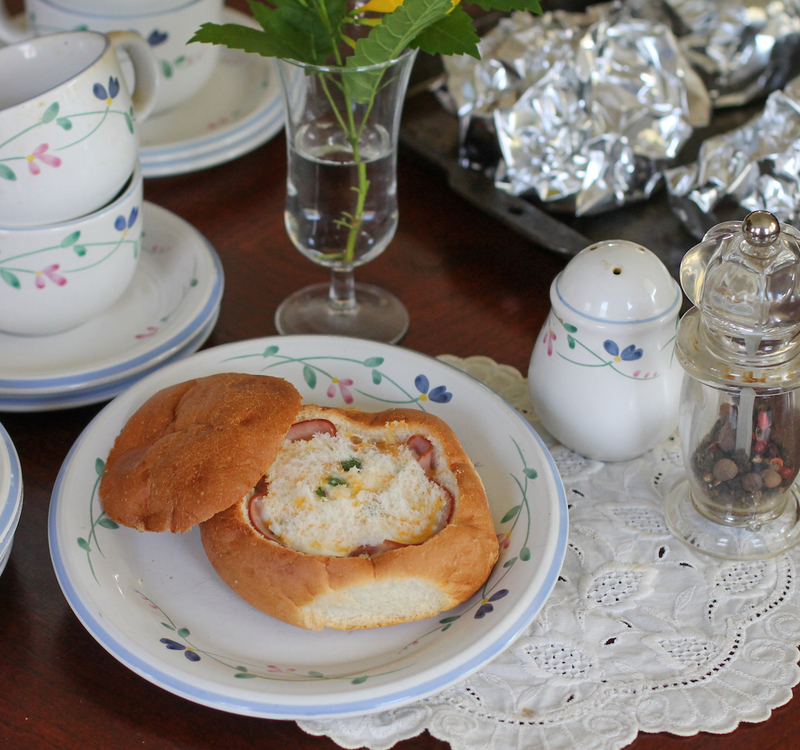 This week my Sunday Supper group is sharing great recipes to serve when you are hosting a sleepover or slumber party. I doubt my make-ahead batter tips are news to most of you so I decided to branch out a little. Baked Ham, Egg and Cheese Sandwiches take a little more time but you save that on clean up! Use a sharp serrated knife to cut the top of your bread roll at a slight angle, like you would the top of a pumpkin for carving. Set aside. 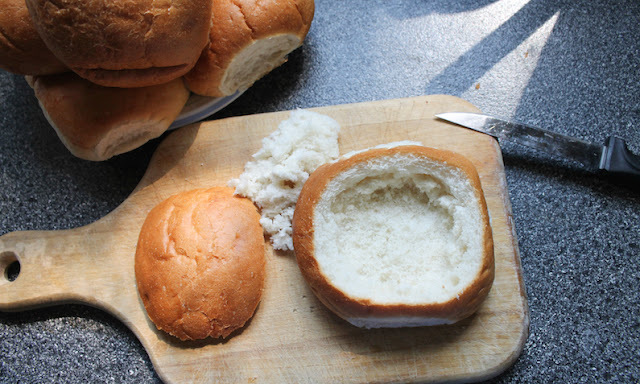 Use the knife to cut around the hole so that you can remove the soft inside of the roll. Save it for another use like breadcrumbs or stuffing. You want to get the walls of the roll quite thin so that the heat can reach the egg quickly when we bake this. Dry the ham slice with a paper towel and fit it into the roll, pressing down on the bottom to create more space for your egg. 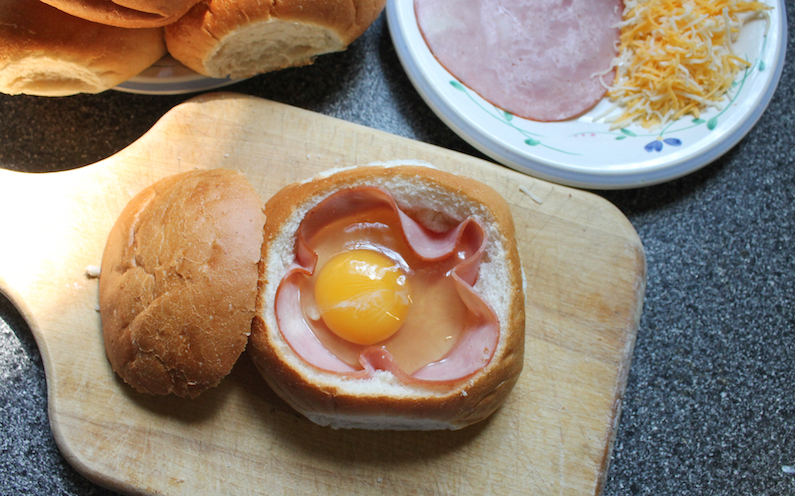 Don’t tear the ham or your egg will leak through to the bread roll, which we do not want. If your eggs are very fresh, you might be able to skip this step: Crack the egg into a slotted spoon with tiny holes to let the very liquidy part of the egg drain away, leaving behind the rest of the white and the intact yolk. Put the egg in the ham “bowl” in the roll. Grind on some freshly ground black pepper then add the cheese on top. Sprinkle with some chopped green onion or chives. Put the top back on the bread roll. 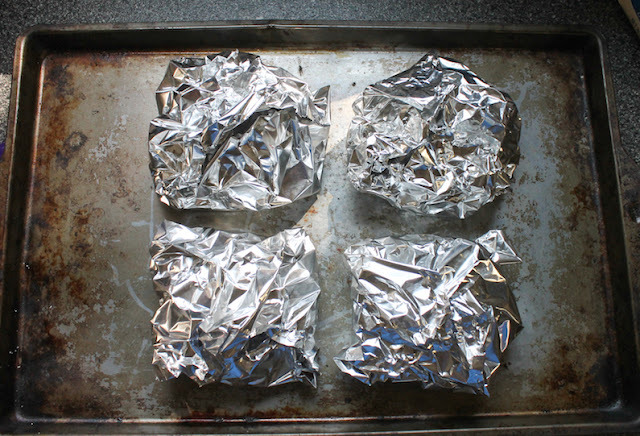 Wrap the whole roll completely with a piece of foil and set on a baking tray. Repeat as many times as necessary to feed all of your guests. 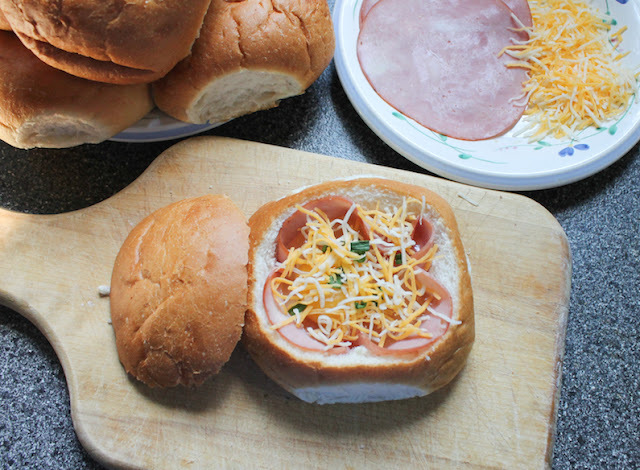 The baked ham, egg and cheese sandwiches can then be refrigerated overnight to be baked fresh and hot the next morning. When you get up the next morning, preheat your oven to 350°F or 180°C and remove the baking pan from the refrigerator. Once the oven is hot enough, put the pan with the sandwiches in and bake for about 15 minutes. Pull one out to check how cooked the egg yolk is. Pop it back in for a little longer if the egg is still a little too runny for your liking. You are starting with cold ham, eggs and cheese so the time will vary by how cold they were and how soft you like your egg yolks. N.B. If you make these and bake right away without refrigerating, they will take a shorter time to cook. I tested it both ways, baking one immediately and baking the other three the next morning. I was very happy with the results either way. Once done to your liking, remove from the oven and leave to cool enough to handle. 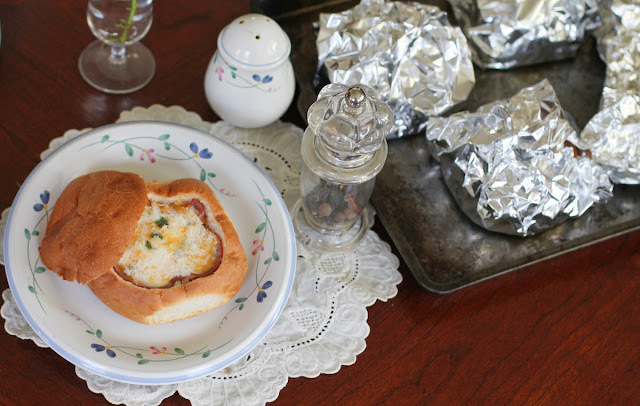 Hand out foil-wrapped baked ham, egg and cheese sandwiches and napkins to your hungry crowd. No plates to wash! Or put them on plates and get fancy. I haven’t tried it yet, but I’m thinking these could even be baked over a campfire in a Dutch oven or in a covered barbecue pit, away from the direct heat. Wouldn’t they be great for a Scout campout? What's your favorite dish to bring or make for a slumber party? If you are looking for some great new ideas, Sunday Supper is here to help. Many thanks to our event manager, Cricket of Cricket's Confections and our host, Marion of Life Tastes Good.